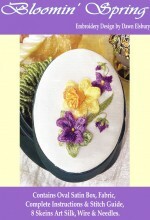 A beautiful spring design in mauves and lemon to suit a covered box. Kit contains needles, 8 shades Art Silk, fabric, wire, full instructions, stitch guide. Designed & Stitched by Dawn Ellsbury. Manufactured & distributed by Rajmahal. Click the button below to add the Bloomin' Spring to your wish list.